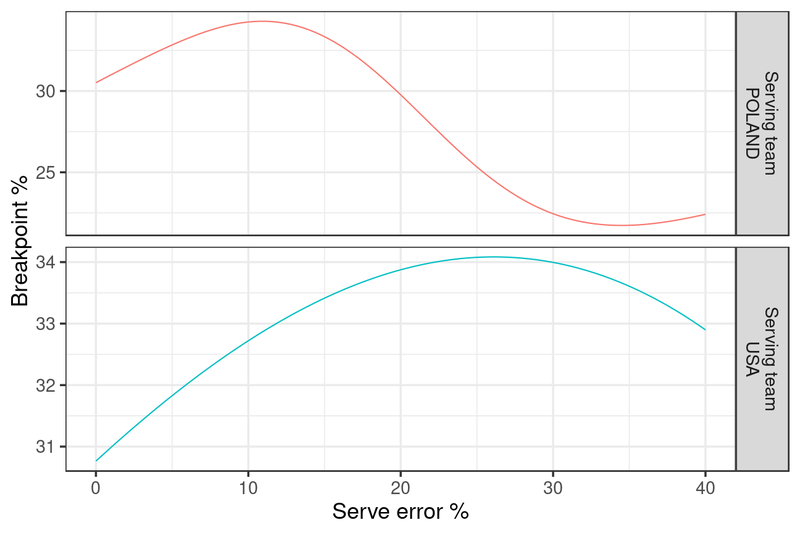 We have looked previously at serve aggressiveness in volleyball, and reached the conclusion that serve error rate is probably a good indicator of serve aggressiveness. 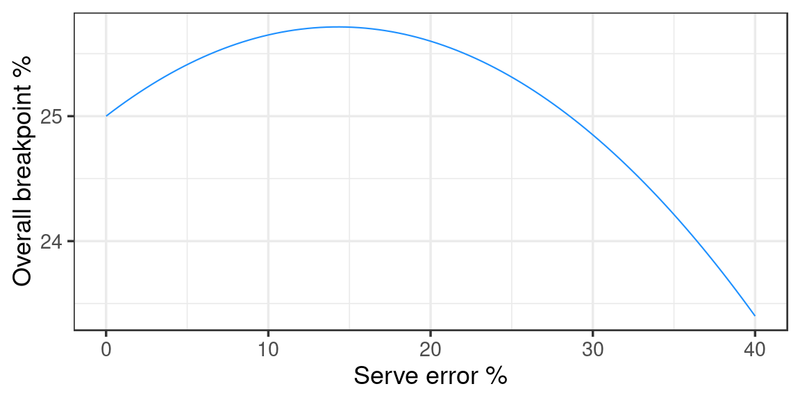 Players with higher error rates are probably serving more aggressively. What does that mean for my overall breakpoint percentage in terms of serve errors? 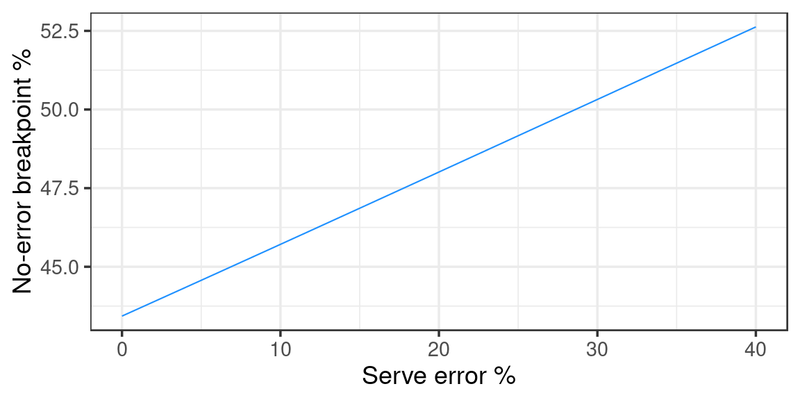 So the overall breakpoint percentage is a quadratic function of serve error percentage. From your high school maths you will remember that this quadratic function is an upside-down U-shape, which means that there is a particular serve error percentage that maximizes my overall breakpoint percentage. That is, my overall breakpoint percentage is highest at a serve error percentage of 25%. The losses that I incur by serving this many errors are compensated for, because I win more points on the serves that aren’t errors. Here my overall breakpoint percentage is highest at a serve error percentage of 14.3%. 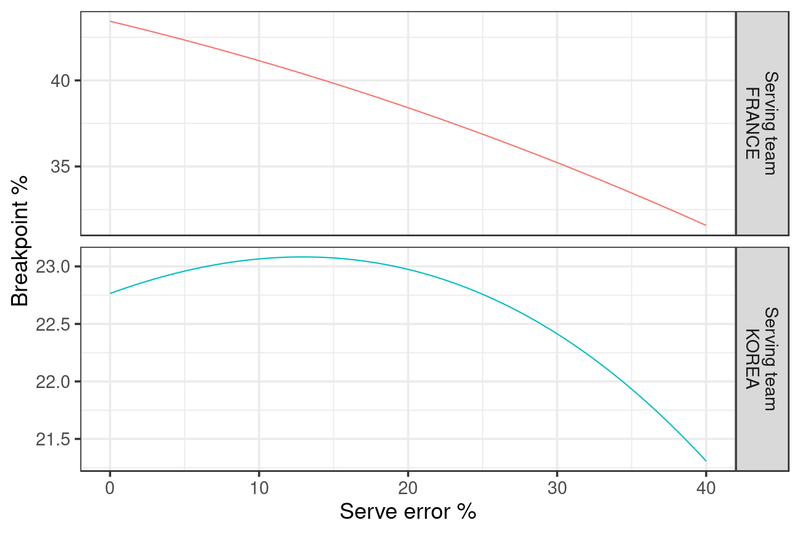 So the optimal serve error percentage is determined by the relationship between serve error percentage and no-error breakpoint percentage, and it seems likely that this relationship will vary depending on the serving and receiving teams. That’s all well and good, but does it tell us anything about real-world volleyball? We demonstrate the idea using data from the preliminary round of the men’s 2018 Volleyball Nations League. In the preliminary round there were 120 matches in total between 16 teams, with every team playing every other team once. The statistical method is still under development, but some preliminary results are shown below. First we calculate the serve error percentage for each player, and for every team we tabulate their sideout percentage against each serving player. We then fit a model of each team’s sideout percentage over different serve error percentages (i.e. the equivalent of the top graph, above). 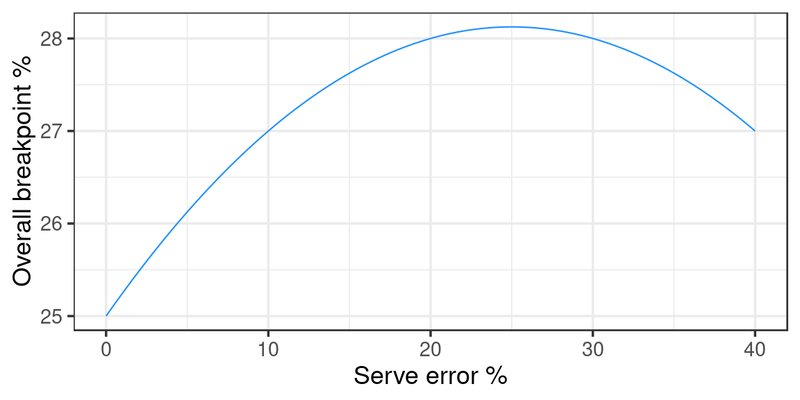 For the stats-curious reader, we do this using a generalized additive model that uses a smooth term to model the dependence on serve error rate. This means that the error/breakpoint relationship is not constrained to be strictly linear, and so the resulting overall-breakpoint curves might not necessarily be quadratic. 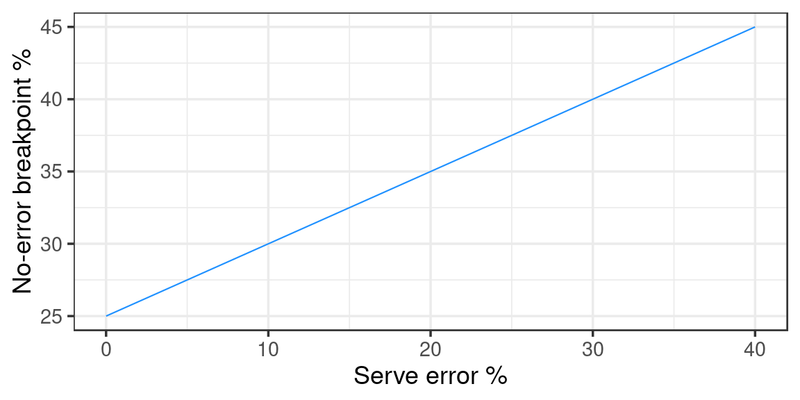 This graph is exactly as we expected: as France’s serve error rate increases, they are more likely to win points on the serves that are not errors. Here Poland’s optimal serve error percentage is fairly low, around 11%, whereas the USA’s is considerably higher (26%). The USA won this match 3:0, with the USA serving 23% errors and Poland 20%. Perhaps Poland might have done better with a lower serve error rate?